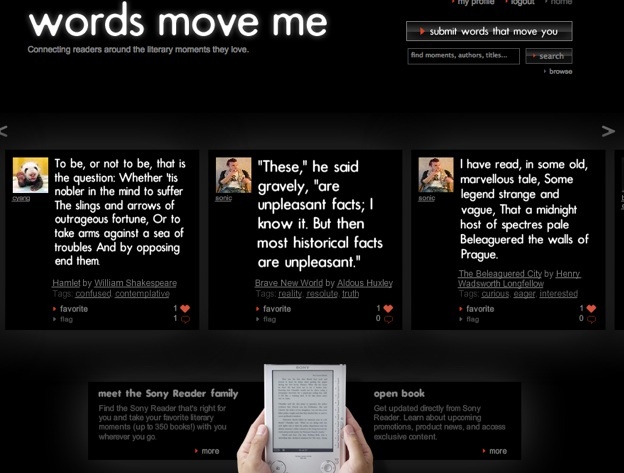 In conjunction with today’s announcement of a new wireless Sony Reader, the electronics giant also launched a literary clone of Twitter called Words Move Me. 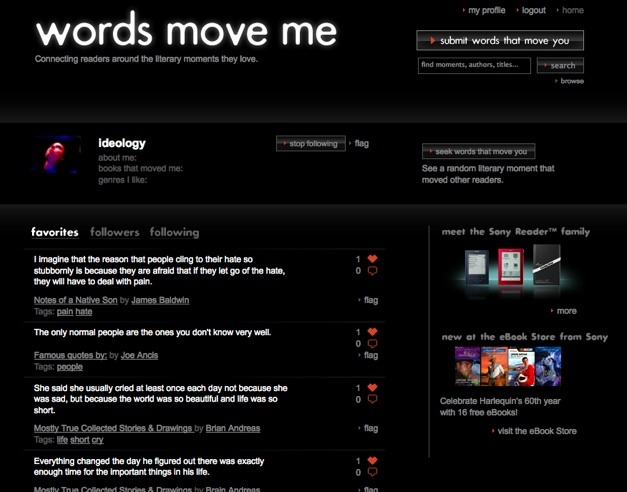 The site falls into the category of viral social marketing—there are links to the Sony Reader website and eBook store plastered on every page—and was pobviously rushed out before it was ready, but it shows some promise as a niche micro-messaging network centered around sharing quotes from books. The problem is that right now it is a self-contained site. Facebook and Twitter integration are coming “in phase 2,” I’m told. If you can’t share your favorite book passages with your existing network, this isn’t going to go far. But it’s coming. Also, the site does not auto-populate book titles or authors, which it should be able to do at least for books in the Sony eBook store or in Google Book Search (which is a Sony partner). Avid readers love to share quotes, but that is not the only things they like to share. Quotes and passages are all good things to share, and can serve as hooks for people to come back and explore further (and mabe even buy a book). The concept reminds me of iWise, which is a way follow famous people through their quotations. It’s Twitter for dead people. And iWise lets you Tweet out your favorite quotes, or get random ones right in your Twitter feed. There is an opportunity for several more focused micro-messaging sites, but they cannot exist in a vacuum.